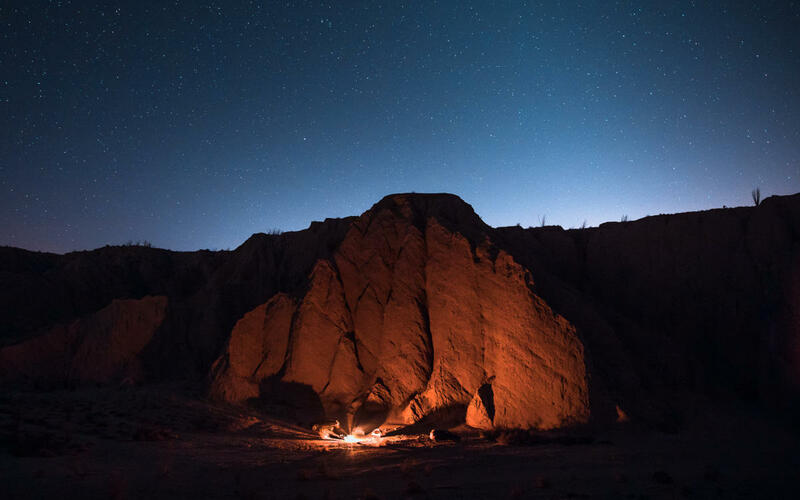 Sleeping under the stars and waking up to the breathtaking desert landscapes of Southern California is an outdoor experience like no other. 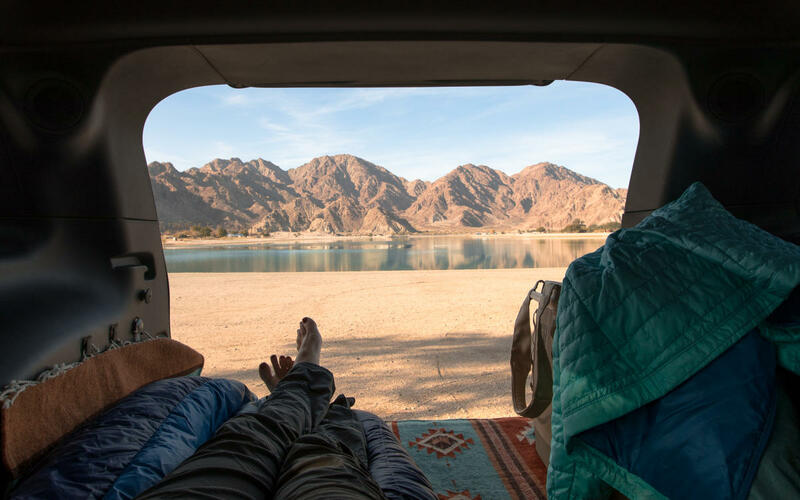 Whether you&apos;re driving an RV or pitching a tent, these are some of the most scenic car camping spots within an hour&apos;s drive of Greater Palm Springs. Cost: $6 entry fee per adult and $20 for primitive campsites, with developed campsites running up to $40 per night. There are only two sites with water, power and sewer hookups ($40), and the rest have water and power hookups ($35) or just water ($25). Notes/rules: Fishing is allowed in designated areas, but a license must be obtained prior to entering the park. Dogs must be kept on leashes, and fires are allowed in designated fire pits only. Bathrooms have flush toilets and coin-operated showers. With views of the hills and a laid-back vibe, Lake Cahuilla Recreation Area is one of La Quinta’s best kept secrets. The majority of the campsites overlook this stunning man-made lake, which is home to a number of avian species. Campsites tucked next to the rocky hills on the north side of the park offer a bit more privacy, and the east side of the lake has a number of areas for fishing. Cost: $10 park entry fee and dispersed camping is free. Notes/rules: Fires are allowed in metal containers only, and campers must pack out ashes. Collection of firewood is prohibited, so be sure to bring your own. When parking and setting up camp, you must be at least 100 feet from any water sources. Cars must be parked no more than one car length off the road, though you may walk in further to set up your site, per park rules. 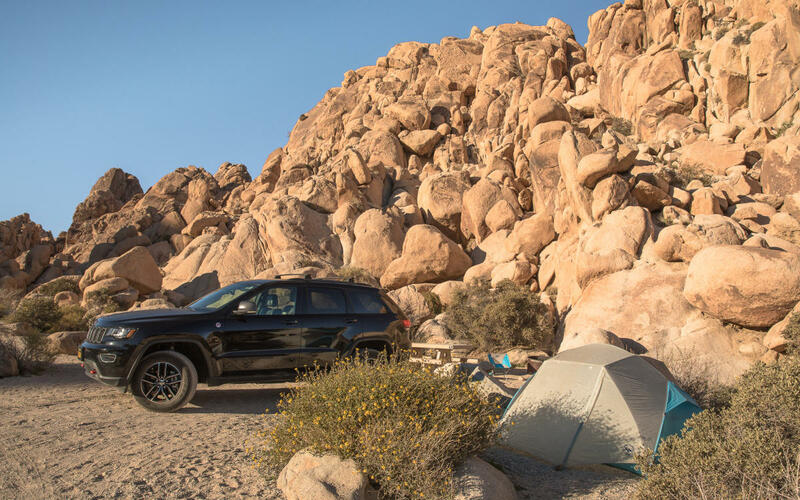 If you’re seeking solitude (and have a 4x4 vehicle), the network of dirt roads in Anza-Borrego Desert State Park offer a seemingly endless amount of options for primitive car camping. Whether you’re looking for an off-road adventure or hoping to find a free campsite close to stunning sunrise and sunset vistas, this is an incredible way to enjoy nature. Please pack out your trash and follow Leave No Trace principles, so others can enjoy this area for years to come. Cost: $10 park entry fee; $60 per night for a cabin and $25 per night for a tent site. Notes/rules: Bathrooms have flush toilets and token-operated showers. Fires in designated pits only. 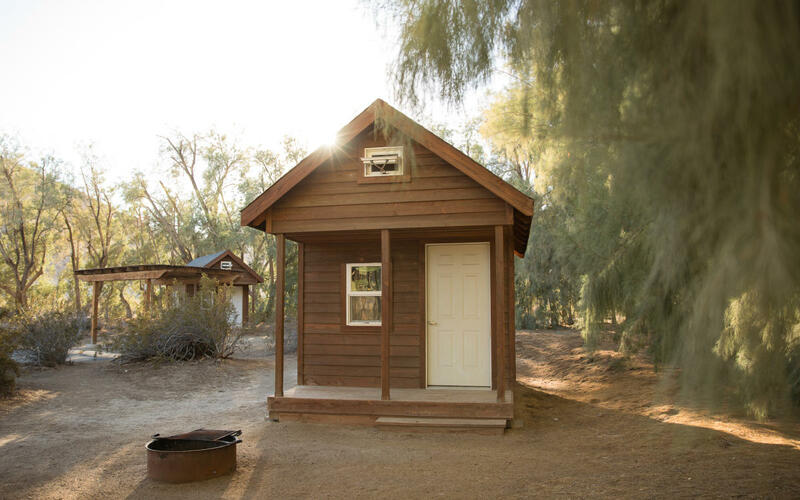 If you want to experience Anza-Borrego Desert State Park but prefer modern comforts when camping, the minimalist cabins at the Tamarisk Grove Campground offer the perfect compromise. The structures have light switches, cots, chairs and a table, and both the tent and cabin sites have tables and shade ramadas. Cost: $30 entry fee (or annual pass) required for Joshua Tree National Park; $20 per night for single tent sites and $40-50 per night for group sites. Notes: Online reservations are recommended, as walk-up campers must re-register for sites daily. Fires in designated pits only, and dogs must be leashed. Pit toilets, and no water. The Indian Cove Campground is accessed from the northern part of the park only, and after checking in at the ranger station, you will be surrounded by massive clusters of smooth boulders. This is a popular spot to rock climb, and since it is not on the main route through the park, it doesn’t tend to get as packed as the White Tank and Jumbo Rocks campgrounds. 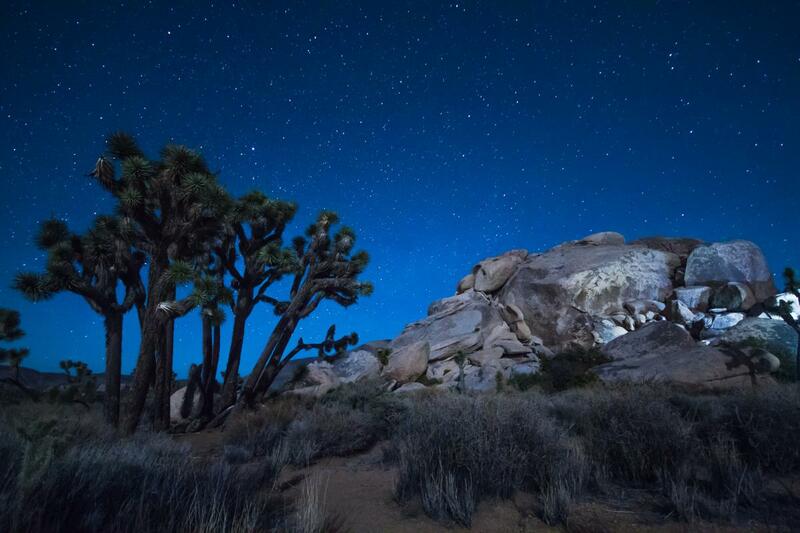 Cost: $30 entry fee (or annual pass) required for Joshua Tree National Park; $20 per night for tent sites. Notes: Online reservations are recommended, and fires are allowed in designated pits only. Flush toilets are available, and while there are no hookups, there is a dump station. Black Rock Canyon is one of two campgrounds in the park that provides potable water. Black Rock Canyon is accessed via a road on the northwestern end of the park only, and much like Indian Cove, it doesn’t tend to get as busy as campgrounds along Park Boulevard and Pinto Basin Road. The campground sits at a slightly higher elevation and offers stunning views of mature Joshua Trees, and there are a number of trails that take off from the area as well. Elisabeth Brentano is a writer/photographer based in California, but her wanderlust takes her all over the world to shoot landscapes, wildlife, and people. After working in a Los Angeles newsroom for nearly a decade, she traded her high heels for hiking boots, and she has been living on the road since 2016. Elisabeth hopes her stories and images will encourage the digital generation to explore more — and be mindful of the impact they have on the planet. Elisabeth has volunteered with environmental nonprofits in Africa and North America, and if she’s not stuck in front of the computer, she’s either hiking, camping or getting ready for the next big adventure. You can follow her at @elisabethontheroad on Instagram, or visit her website, elisabethbrentano.com.